As one strolls through the stunningly bright city lights of London Victoria, one discovers a beautiful sight of a little Japanese-inspired restaurant as one's stomach rumbles in savoury food-deprived agony... and one was quite satisfied once indulged in its craft. itsu is a lovely little fast food restaurant located in multiple places in the UK, but mainly basing its glory in various places in London. Its cuteness factor is clearly because of its Japanese-inspired decor as well as its extremely healthy take on Asian food! This cosy fast food restaurant aims to serve healthy, nutritious food that are delightful to the tastebuds as well as to our wellbeing! It's clear that they try to avoid serving oily foods by serving hot soup-based dishes and some rice and salad accompanied dishes instead. Their hot food was limited, serving mostly only chicken and fish as non-vegetarian dishes. 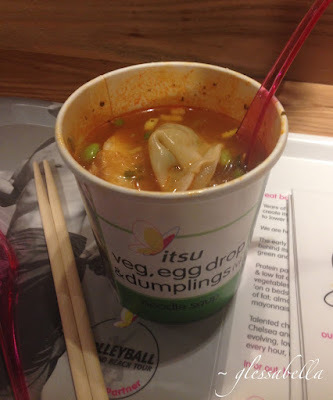 Their hot soups were all vegetarian-friendly, and they even had vegetarian dumplings! Uhhh man, I could really devour some dumplings right now. The chilled food was filled with lots and lots of fresh sushi and salads that you could either eat in or take away, good news for those who want to take the goodness home! 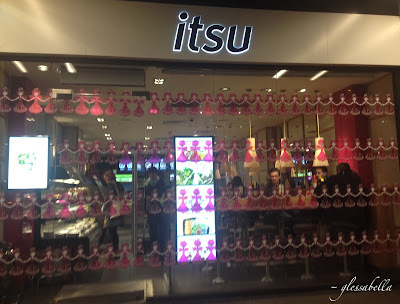 But for me, I just had to try their hot food and the experience of eating at Itsu. I ordered the veg, egg drop & dumplings soup simply because the sound of gooey whole egg and scrumptious vegetable gyoza dumplings bathing in a tasty vegetable soup was just TOO TEMPTING, especially to an extremely hungry student that had just experienced a 2 hour coach trip, and I really, really don't like coach trips. I can still smell the sweet aroma of the ginger, celery, sesame and leek broth. This flavoursome soup with the silky texture of those light crystal noodles was heavenly, though the slight tang to the dish is not for everyone. The gyoza dumplings were tasty; they absorbed the rich flavours well and were complimented by the edamame beans that had a nice bite to them. Much taste, very goodness. There was so much food I wanted to try; they had healthy desserts like their frogo, sweet pudding pots and naturally fresh fruit. 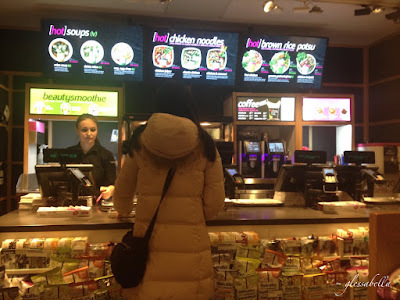 They even make their own smoothies, fruit and vegetable juices and detox drinks! It's all about the healthy living at itsu. 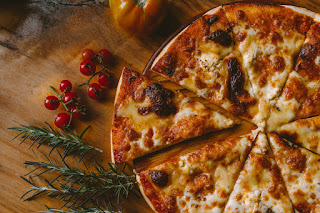 You truly do eat beautiful there. Seriously though, words just do not justify how yummy that runny egg was against all of those hearty, warm vegetable flavours. You're going to have to try it yourself!